Following the Beginning Quilting 101 classes we will learn more skills to advance our knowledge about quilting. We will continue to improve on rotary cutting skills and more accurate quarter inch seams while completing a slightly more challenging project. 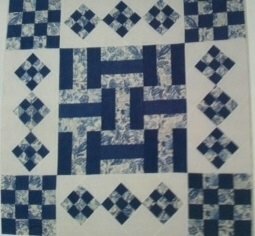 We will explore basic grids and layout patterns for quilts plus more time on the details of completing a quilt top. There are three parts to this class.